Well, it’s been over a month since the Walt Disney Goofy Challenge and recently I’ve been thinking a lot about races for 2013 – how many? what distances? which ones? Around the new year I started to see a lot of posts and tweets about people doing “13 in 13” (13 races in 2013) and I briefly got caught up with the idea of doing it. I started searching for local races to fill the gaps between the “bigger” races I was already planning on doing, but the more I thought about it the more I realized I didn’t really want to do all these extra races just for the sake of doing them. Don’t get me wrong, if doing “13 in 13” is a goal you set for yourself then by all means go for it! I decided that I’d rather focus on some speed work this year and set a goal for myself of PR’ing the half marathon distance and trying to do a couple of races that are on my bucket list. So, with that, I present my race plan (so far) for 2013! Walt Disney World Goofy Challenge – DONE! NYC 13.1 (PR attempt / pace gauge) – I did this race last year and to be honest it was only OK, but I have a couple of friends doing it so I figured why not! I’m not sure I’m quite ready to try for a PR, but this is a nice flat course, so who knows! If nothing else it will be a good gauge to see where I am right now. Long Island Marathon (PR attempt) – now this is still totally TBD, but I’m seriously considering doing a full marathon this May. Why you ask? Time. I want to see what my full marathon time would be NOT at Disney (i.e. not stopping for pictures or battling 100% humidity). I really felt I was in shape to PR at the WDW Marathon this January, but the weather unfortunately did not want to cooperate, so rather than fight it I slowed down and just enjoyed the race. The Long Island Marathon is a local (for me), inexpensive, no frills kind of race, but may be just what I’m looking for to try for a PR! The Falmouth Road Race (Bucket List) – This race is only 7 miles, but runs right along the coast not far from my place in Cape Cod which makes it a must do for me! I entered the lottery for it last year and didn’t get it which means I have an automatic entry for this year! Disneyland Dumbo Double Dare (PR attempt / Bucket List) – runDisney & new race…yes please! I LOVED my first trip out to Disneyland last year for the half marathon and I can’t wait to do it again! My current 1/2 marathon PR is on this course so with some speed work and a little Disney magic maybe there’ll be a new one?? 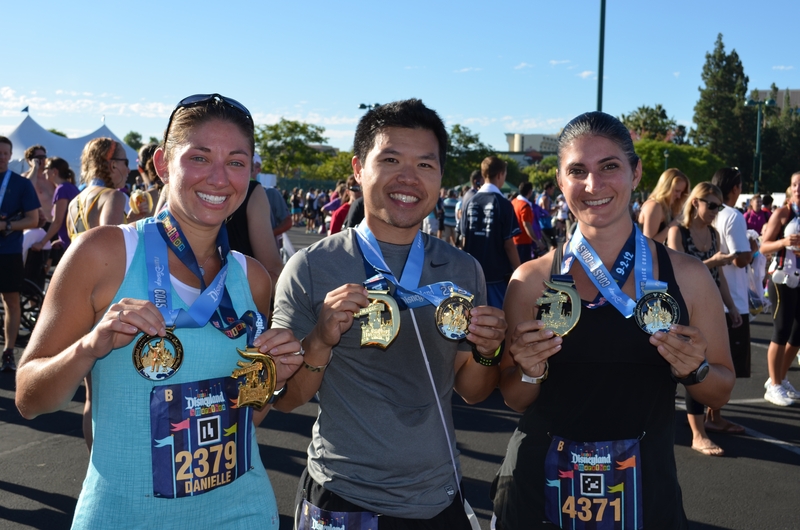 2012 – Me, Patrick and Jenn with our Disneyland and Coast to Coast medals! 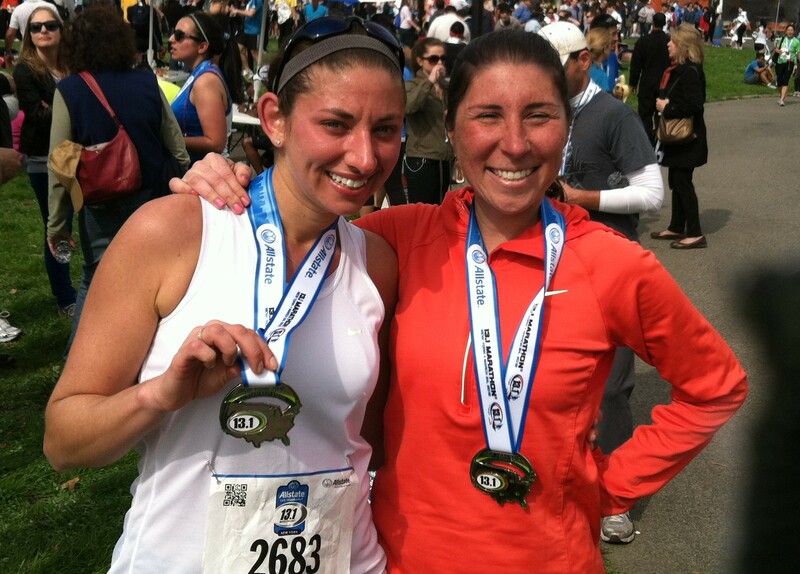 Marine Corp Marathon (Bucket List) – a few friends (some of which are pictured above!) and I have been talking about doing this race this year, it sells out pretty quickly, so fingers crossed we’ll get in! If not, I’ll probably do the Cape Cod or Hartford Marathon, which are both on my bucket list as well. 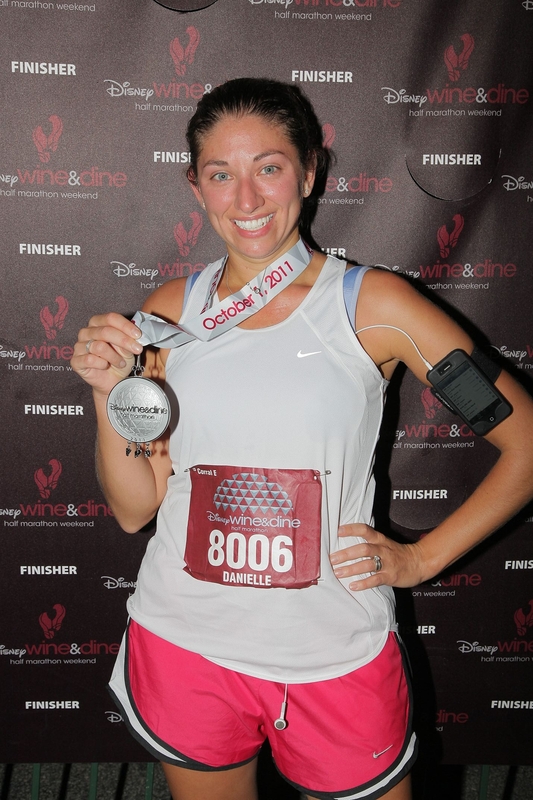 Wine & Dine Half Marathon – ok, so this race doesn’t particularly fall into either the “Bucket List” or “PR attempt” category, but it holds a special place in my heart since it was my first race ever 2 years ago, so I sort of consider it an “anniversary”! W&D 2011 – 1st race ever! triathlon – this is on my 2013 Goals & Growth list, I have one in mind, now I just need to start swimming and biking! Well, there you have it so far! I’m sure I’ll add a few things in along the way, and who knows, maybe I’ll even end up with an unintended “13 in 13”, but I really want to try to make sure that each race I do has a purpose! I’d love to hear if you’ve done any of these races and what you think of them! Do you have any Bucket List races? What are they?? My ultimate bucket list is the Goofy challenge! I am so impressed you did it. Also the lifetime goal of 50 marathons in 50 states! The Goofy Challenge was such a great time! I think the key is to not worry about your time and just have fun (oh, and some good recovery between races!). Wow, that’s a lot more races than I have. Of course I’m not doing any fulls, waiting for the Goofy for that. Right now I only have the 2, although, I’m crazily still seriously considering the Wine & Dine. I just loved that race so much! And I understand wanting to do your anniversary runs. The Princess was my 1st half last year and I’m feeling pangs of really wishing I was there this weekend! Wow, you’re going to do your first full marathon as art of Goofy?! I am always so impressed when people do that. I thought about it, but then I decided to do the full one year and Goofy the next. What year are you planning on doing it?? Yeah, it’s actually a LOT smarter to do it the way you did it. But, I can honestly say I don’t see myself running more than 1 marathon (although I said the same about the 1/2). And I REALLY want to do Goofy, so it just seems like this is the way it’s gonna happen. If it’s a good enough plan for Joey Fatone, it’s good enough for me! lol Who knows, maybe after I do it I’ll change my mind about the fulls. Yeah! I know it’s far off, but we’ll have to try to remember to meet up and say hi!